New Delhi, April 22 (IANS) The Congress on Monday released the list of candidates on six out of the seven parliamentary constituencies in Delhi for the May 12 Lok Sabha polls, signalling a non pre-poll alliance with the national capital's ruling Aam Aadmi Party (AAP). 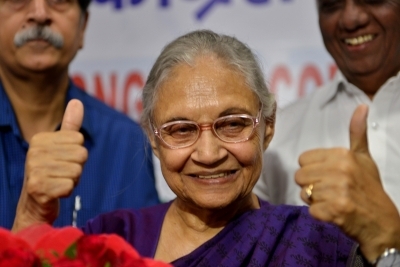 The three-time former Delhi Chief Minister Sheila Dikshit will contest from the North East Delhi seat, while former Delhi Congress Chief Ajay Maken will contest from New Delhi, said a letter by Mukul Wasnik, General Secretary of the All India Congress Committee (AICC). Dikshit will be facing the Bharatiya Janata Party's (BJP) Delhi chief Manoj Tiwari and the AAP's Dilip Pandey. Senior Congress leaders and also former presidents of the Delhi Pradesh Congress Committee (DPCC) J.P. Agarwal (Chandni Chowk) and Arvinder Singh Lovely (East Delhi) are also in the list. Rajesh Lilothia, former MLA and the Working President of DPCC will be the party's face from North West Delhi, while Mahabal Mishra will contest from the West Delhi seat. The party however, is yet to finalise a candidate for the South Delhi seat. For weeks, alliance talks between the AAP and the Congress were on, although the former had listed out its candidates for all the seven seats last month. The two parties wanted to join hands in order to defeat the BJP, who won all the seven seats in Delhi in 2014 elections.